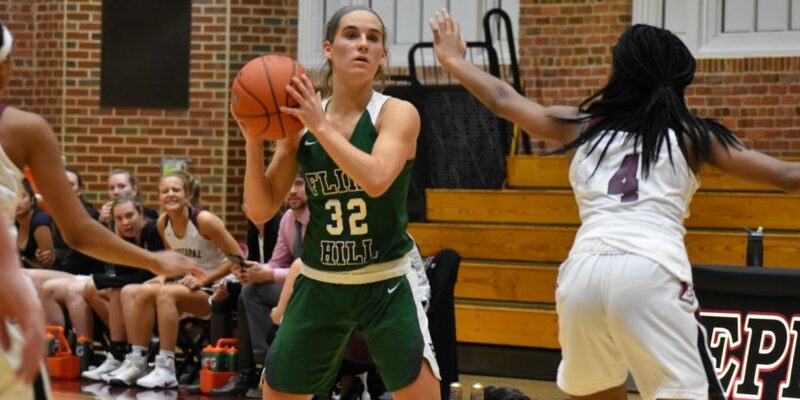 Flint Hill senior Whitney Wiley had 14 points, seven rebounds, seven steals, and five assists in her team's win Monday. When you’re up 15 points in the fourth quarter and the other team rallies to tie the game, it might be time to panic. 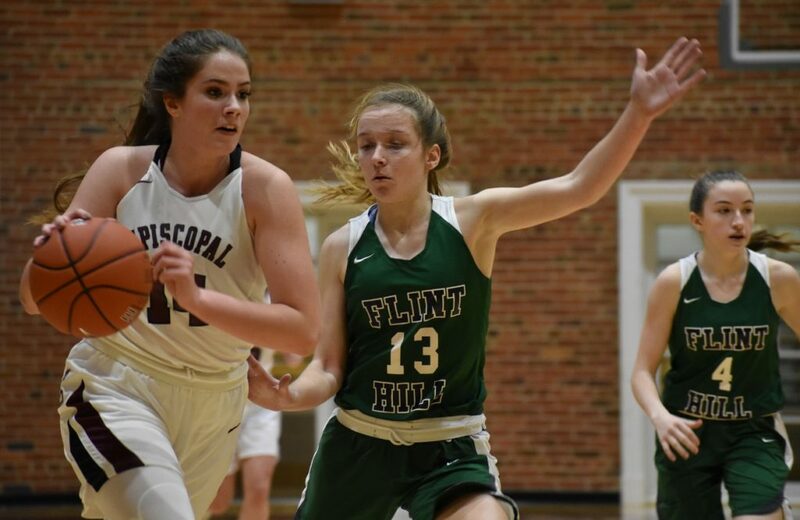 Flint Hill blew that exact lead Monday night at Episcopal but exhibited no signs of panic whatsoever, righting the ship and holding on for a 56-47 victory. Huskies coach Jody Patrick can, and did, thank her seniors for that. Versatile senior forward Claire Miller drives to the hoop for the Huskies. They may be team-oriented, but they’re also pretty good individually at the game of basketball. Kathleen Boyce had 12 points, Claire Miller 13 points and seven rebounds, and Whitney Wiley a typical do-it-all night with 14 points, seven rebounds, seven steals, and five assists. That defense was key Monday night. 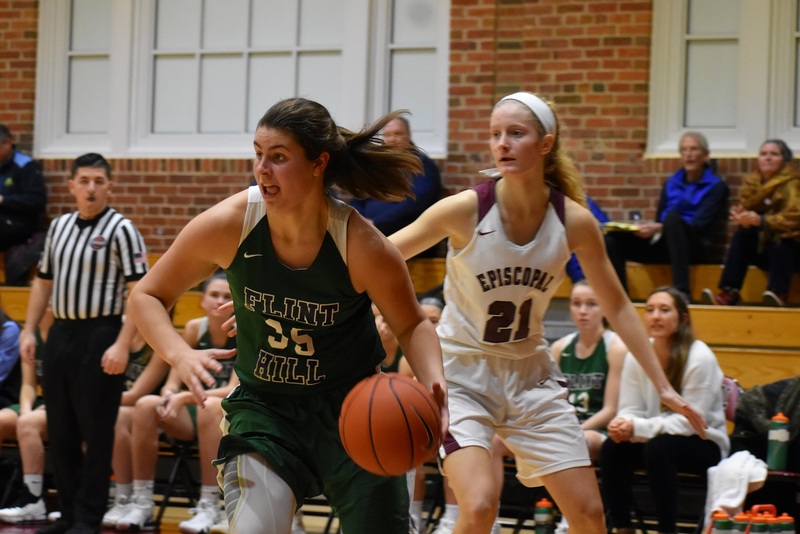 Episcopal came ready to play against its ISL rival, racing to an early lead behind the strong play of junior forward Haley Sabol and retaining it by one point after a quarter. That’s when Flint Hill’s full-court pressure started to really started to bother the Maroon, with Wiley and her teammates forcing turnover after turnover. Flint Hill won the second quarter 20-9 and after a low-scoring third quarter led by ten going into the final quarter. Flint Hill’s Kathleen Boyce, another senior, had 12 points in the win. It appeared over when the Huskies upped their lead to 15 in the fourth, but that’s when Episcopal showed some grit to battle back. Sabol and Colgan transfer Maya Thompson were extremely effective at getting to the rim. That, coupled with an inspired Episcopal effort on defense, resulted in the 15-0 run and a tie game at 43 with just over three minutes left. But the Maroon, already challenged for depth with the season-ending ACL injury to senior guard Kailyn Shepherd, ran out of gas a short time later. Miller wisely by-passed a perimeter shot to take it strong to the rim for an old-fashioned three-point play. A short time later Wiley ripped down a defensive rebound and went coast-to-coast with a full head of steam for a lay-up. Boyce hit some free throws and that was that. Junior forward Haley Sabol (19 points) had a nice night for Episcopal. The Huskies (3-2, 10-5) have certainly been getting it done lately, winning their sixth straight contest. They will get right back at it tonight with a game against Stone Ridge, and have two more games after that still this week. 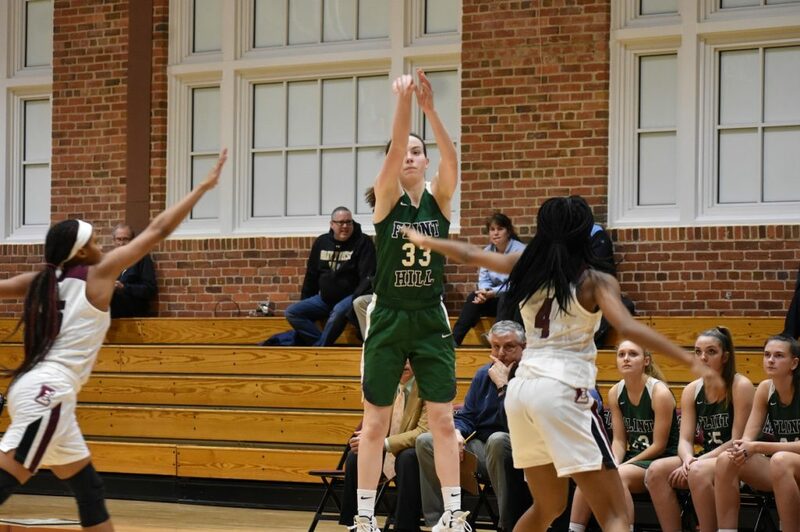 Episcopal (2-3, 10-4) was led by Sabol’s 19 points, with Thompson adding 14 and seven rebounds. Dymin Gerow added 10 points for the Maroon, who will play Sidwell Friends tonight.